YoYoExpert - Let Everyone Know You Are a YoYoExpert! YoYoExpert is proud to present a shirt that is very special to us. The official Contest T-Shirt is here! 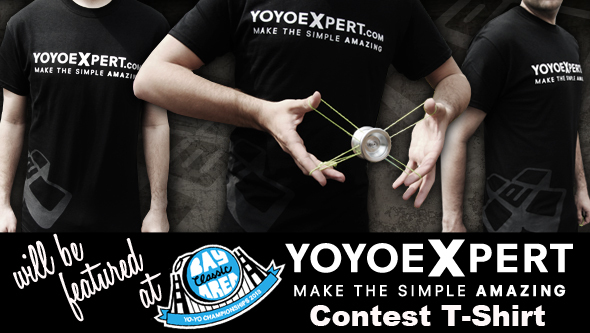 The Contest T-Shirt features the YoYoExpert logo as well as our signature logo subtly printed on the side. Look cool on and off the stage. At YoYoExpert we are a big supporter of the competition scene in the United States and around the world! We consider nothing more fun and enjoyable then getting to watch new players get on stage for the first time and want to encourage everyone that can find a contest near them to get out to it! Here is the idea. Buy a Contest T-Shirt for just $8. Get out to any contest wearing your contest t-shirt and snap a picture of yourself in action at the contest wearing it. Submit your photo along with name and order number via email to Contact@YoYoExpert.com. We will email you back with an $8 Gift Certificate good at YoYoExpert! It is that easy!